There are some great changes on the horizon for DataXchange from Scytec. Shop Floor Automations, an authorized reseller of the program, would like to take the time to quickly highlight previews of changes to come. 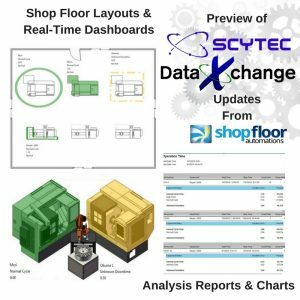 Enjoy OEE machine monitoring with a real-time shop floor layout. 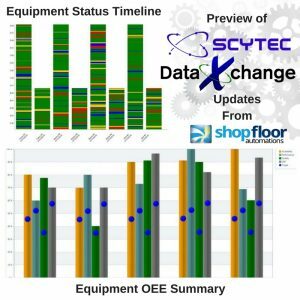 New OEE charts, views from a real-time dashboard, plus multiple part-time analysis reports, a shop floor layout view in the dashboard, and various equipment status comparison charts that will analyze equipment utilization across a span of different days will be included in new updates. Check out our main page for what we will be up to at IMTS 2016, and call (877) 611-5825 for machine monitoring, and other shop floor solutions.